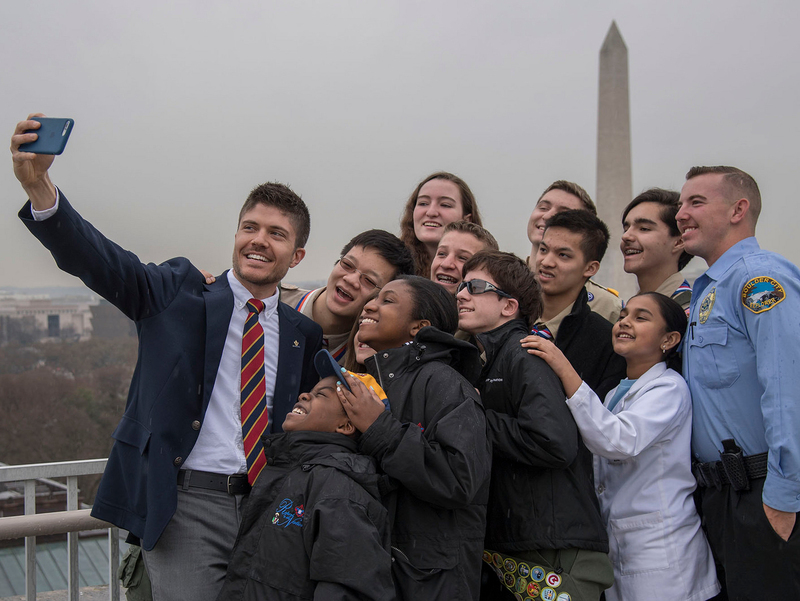 When the Boy Scouts of America reaffirmed its long-held membership policy last June after months of media coverage and national attention to the issue, some leaders thought that signaled an end to the conversation. Not so, as you no doubt know. As BSA President Wayne Perry recently said, many unit-level volunteers weren’t aware of the policy before the reaffirmation. “What we discovered as your Key 3 was that it started a very intense conversation,” he said. In that eight-month conversation, Perry emphasized that he didn’t speak with outside special-interest groups with no affiliation to Scouting. Instead, he said, “I heard only from Scouters, people with different views than my personal views. That’s why Perry, Chief Scout Executive Wayne Brock, and National Commissioner Tico Perez — the National Key 3 — have launched what they call a “family discussion” that’s set to take place over the next three months. Who’s invited? The National Key 3, chartered organizations, council and district volunteers and professionals, volunteer committee members, and Scouters and Scouts. National committees are now receiving directions about how to proceed. The result of this “family discussion” is expected to be a resolution presented in May at the National Annual Meeting (NAM) to the voting members of the national council, a group consisting of volunteers from every local BSA council who have already been named as voting delegates. Much like the Electoral College, the number of delegates is based on a council’s membership; larger councils get more voting delegates. Nothing has been decided. The resolution, which will be distributed to voting members at least 30 days before NAM, hasn’t been written. That’s what the “family discussion” among volunteers and professionals will help create. This dialogue didn’t come out of the blue. The reaffirmation prompted the National Executive Board to launch discussions about the issue, including a conversation about potentially amending the policy to allow chartered organizations to accept Scouts and Scouters consistent with their organization’s principles or beliefs. And throughout this dialogue, national commissioner Perez said he’s heard from passionate Scouters on both sides of the issue. Out of that passion, emerged something positive. Scouting’s a big organization. We’ve got 2.7 million youth and 1 million adult members. You’ll find packs, troops, teams, ships, posts, and crews in all 50 states and even some in Scout units overseas. As is true of our country as a whole, Scouts, Scouters, and Scout parents have diverse beliefs about a number of issues — religion included. And Scouts are taught to respect others, regardless of any perceived difference. That’s why Perez, Perry, and Brock each stressed that they aren’t pushing Scouters to take one side or another. They’re merely presenting the facts and helping to empower stakeholders to make an informed decision and do what’s best for the BSA. When the BSA announced on Feb. 6 that it would begin a three-month review of the membership policy, it also vowed to leave no stone unturned. That means committees will review the concerns of youth, chartered organizations, and parents, in addition to discussing financial, fundraising, and legal concerns. Planning (Feb. 6-28): The BSA defines desired process and intended outcomes. Listening (March 1-April 5): BSA committees engage key stakeholders for input and the development of assessments. Evaluating (April 5-17): BSA officers review committee reports and prepare a resolution that the National Council voting members will act on at the National Annual Meeting in Grapevine, Texas. Educating (April 18-May 24): The reports and the resolution are shared with the voting members of the national council and the Scouting family. Deciding (May 22-24): The BSA conducts on-site information sessions for voting members at the National Annual Meeting, and a vote takes place. Implementing (May 24 and on): Based on the results of the vote, the BSA will determine and implement the next steps for the organization. A difficult decision faces the Boy Scouts of America right now — that much is clear. Our national Key 3 — Perry, Brock, and Perez — said they’ve already spent 100 hours a week talking to others and responding to emails and voicemails. The BSA’s National Council office received an outpouring of feedback on both sides. What’s more, Scouting’s volunteers and professionals have devoted (and will devote) equally long hours to studying the issue. You have to applaud that. One clear certainty about this issue is that everyone has an opinion on the best course of action, and each opinion has value and should be heard. So as we proceed, let’s remember that courtesy and respect for those with whom we disagree will help us work together to make One BSA that will last for generations to come. We can disagree on a variety of topics while still working together to change the lives of youth through Scouting. We’re all here for the boys and girls of this movement, and we owe it to them to cast aside our preconceived notions and come to the table with one ultimate goal — doing what’s best for the youth we serve. The next century of Scouting depends on it.